Maaloula is a small town located 56 kilometers northeast of Damascus. As is the case with almost every human settlement in the Qalamoun region, two factors determined the choice of its position: a geographical one (the presence of fresh water) and a historical one (the search for security). Christianity remained the dominant faith of the Qalamoun until the 18th century while 80% of the neighboring populations had by that time converted to Islam: Homs (north), Baalbak (west), and Damascus (south). In fact, important Christian communities were to remain in the Qalamoun area right until the 20th century as is the case in Yabrood, Saydnaya, Maaloula, and few others. There also exists another peculiarity that few places have maintained: Maaloula in particular has kept a Syriac dialect though the overwhelming majority of Syria has converted to Arabic. 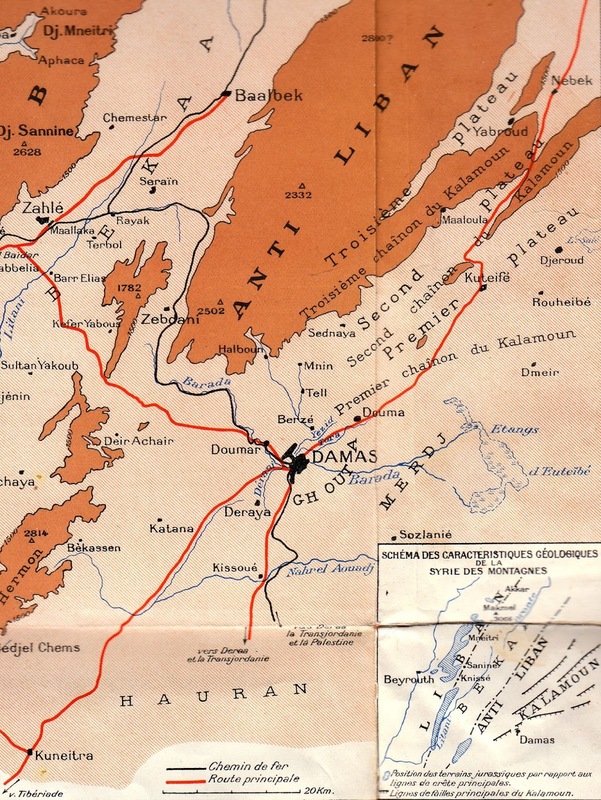 The inhabitants of Saydnaya still pronounce Arabic with a Syriac accent. Both Saydnaya and Maaloula have the aspect of citadel-village. In the case of the former, the lofty Our Lady of Saydnaya Monastery dominates its surrounding from a height of 60 meters. For its part, Maaloula occupies a strategic place on the slopes of the Third Qalamoun Mountain Chain as to make it possible for a handful of defenders to repulse the attacks of hundreds of armed men. this was demonstrated in the events of 1925-1926 (the author here makes a not-so-subtle reference to the Great Syrian Revolution implying that Muslims attacked or at least contemplated attacking France’s Christian protégés). 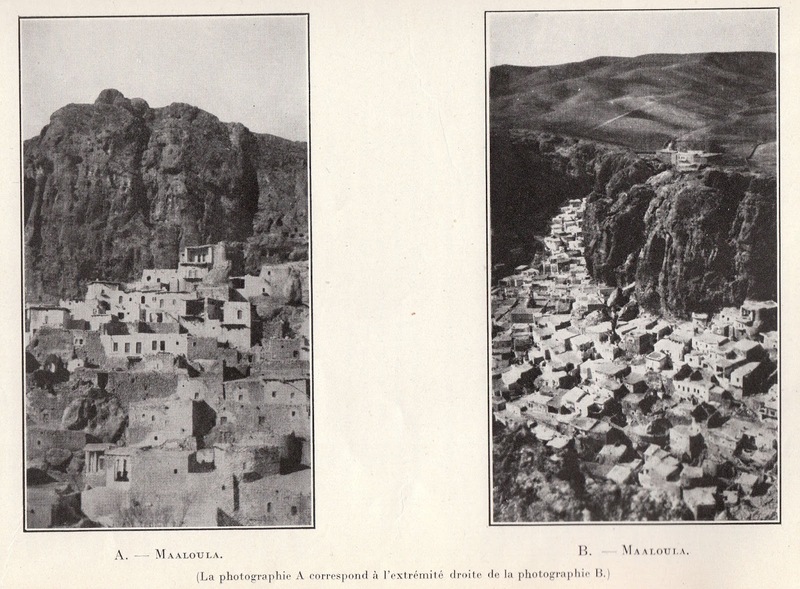 Maaloula counted about 1500 inhabitants in the early 1930’s, all Christians with the exception of few Muslim families. The town is quite old and its earliest dwellings were situated at the very crest of the mountain chain. Under the Romans, its residents dug caves into the rock to create rooms and storage places. Those caves often communicated, and were sometimes superimposed one on top of the other as to create multi-level homes. The settlement gradually extended down the slope of the mountain to accommodate its increasing population and get closer to the irrigated land. The constructions had to follow the rugged landscape and make use of every single space amenable to human use. The outcome was a labyrinth of dwellings and alleys and the only street worthy of the name was (at about 1930) the automobile road leading to the Mar Takla Monastery. It was developed in 1928. For foreign visitors, the town of Maaloula represents a maze of narrow alleys and dead-ends. For its residents, getting from one path to another is quite easy as they enter the court of a house to climb the stairs of another then emerge onto the terrace of a third, to finally land at their destination. Women are seen twice daily descending or climbing steep declivities, carrying their jars on their shoulders, heading to the spring to fetch fresh water for domestic use. 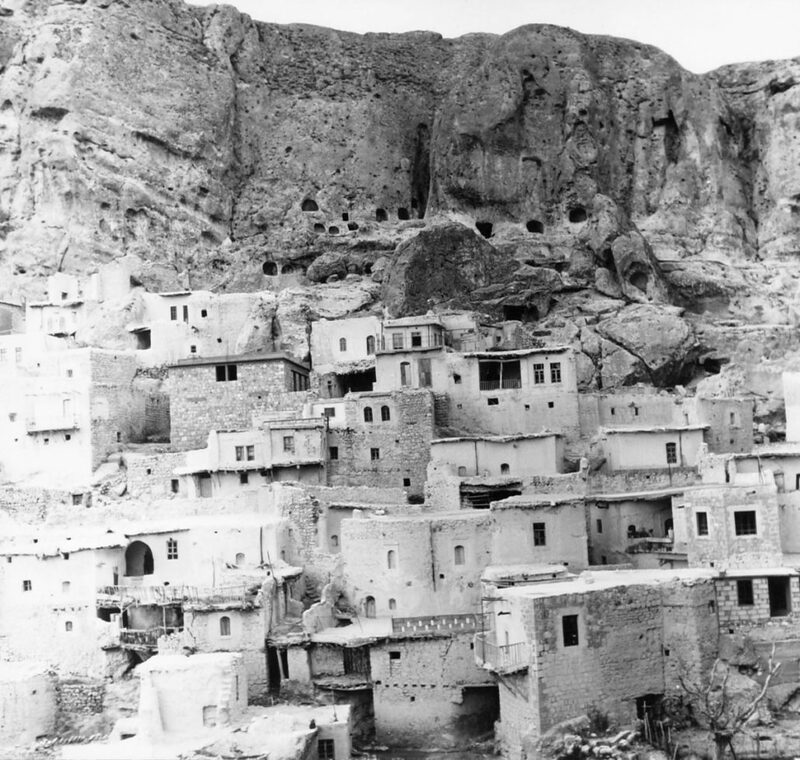 Maaloula was an isolated and withdrawn town at the time, trying as best it could to secure its own needs. The animals necessary for the daily milk supply were kept near the inhabitants despite the limited space. The sheep were even lodged on the balconies along with their fodder.